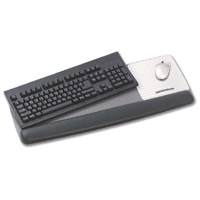 This palm rest with keyboard pad is 18.5" Wide x 10" Deep x 1" High, the wrist rest itself is 3" Deep. This product can support your palms when taking short breaks between typing. NOTE: Never rest your 'wrists' on a rest as this cuts off blood flow, only support your palms. The non-skid base on the pad prevents your keyboard from moving on the worksurface or relative to the palm support. 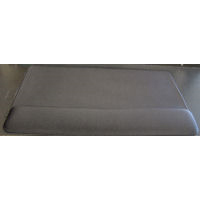 This is a basic foam wrist rest which attaches to all Waterloo articulating arms. The 3M Gel Wrist Rest Platform for Keyboard and Mouse is designed for users who want to reduce the upward bend at the wrist (i.e. wrist extension), with its associated risk of injury to the wrist and forearms, when working with conventional input devices at a seated or standing workstation. Placed directly on the desk surface, the platform provides a base for the keyboard and the mousing area, with the gel wrist rest spanning the distance between the left edge of the keyboard and the right side of the mousing area. The wrist rest provides support beneath the palms when typing, keeping the forearms, wrists and hands in comfortable alignment. When placed beneath the heel of the hand, the gel wrist rest also helps to align the wrist and forearm when mousing. Two sets of optional rubber feet are included with the platform. When attached beneath the front of the platform the feet create a negative tilt of either 5° or 10° to provide further insurance against wrist extension. Note: A greater degree of negative tilt is often necessary to minimize wrist extension at standing workstations. The wrist rest is 25.5" long, 0.25" thick, and made of gel-filled leatherette embedded with antimicrobial properties to inhibit the growth of bacteria. Included with the platform and wrist rest is a 3M Precise Mousing Surface (designed to improve optical tracking and preserve battery life). The mousing surface is repositionable and can be placed to the left or to the right of the keyboard. 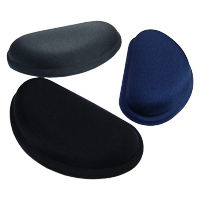 When employed correctly as a palm rest, the Softworqs Keyboard Gel Palm Rest provides resilient support for the palms, yet still compresses sufficiently to eliminate pressure points beneath the palm (or heel of the hands). Keeping the palms elevated reduces the potential for the wrists to drop into a position of wrist extension, with the associated risk of injury to the wrists or forearms. At 26.75" wide by 2" deep the palm rest is wide enough to provide support during both keyboard and mouse usage. The 0.75" height will work with most standard membrane or mechanical switch keyboards. Users with very low profile scissor-switch keyboards should consider a lower profile palm support that better matches the height of their keyboard. The Keyboard Gel Palm Rest serves to keep the wrist elevated towards a more neutral position, assisting in the avoidance of injury to the wrist or forearms that can develop from sustained wrist extension. The gel core is covered with one of two finishes. 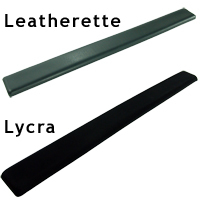 The low-friction Lycra model permits the hand to move across the surface with minimal effort while the Leatherette model is easily cleanable. 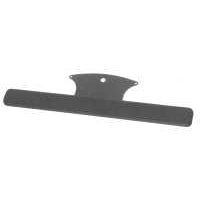 The underside of the Keyboard Gel Palm Rest is an anti-skid material that keeps the rest in place on the worksurface.